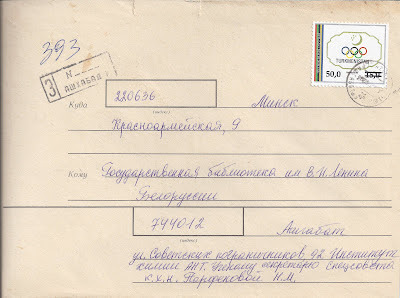 First of all: A reader of this Blog asks me about Turkmenistan postal rates since 1991. I have no idea! Does anyone know? Are they published somewhere? If you can help, please use the Comment box to help. Thanks. A year ago I blogged about Turkmenistan's officially damaged stamps, but I did not have a scanner able to show them properly. Now I do. 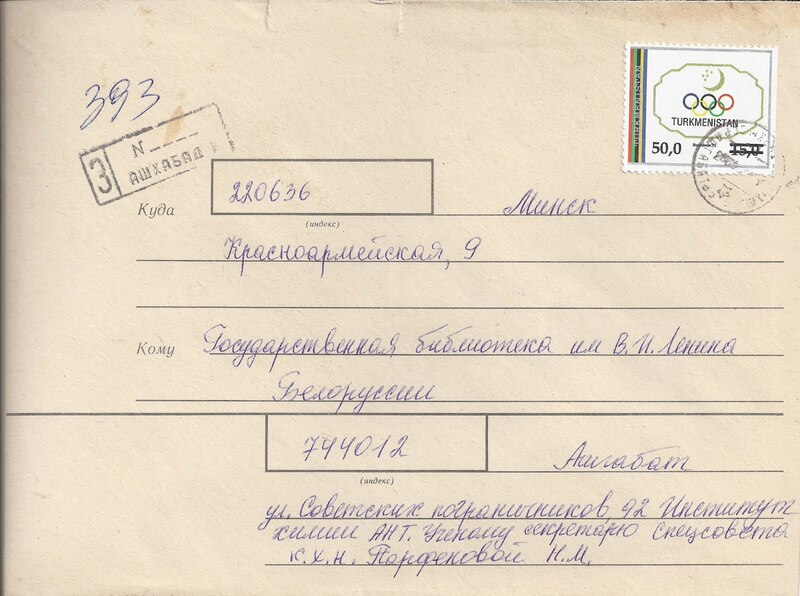 See the cover and the enlarged section - and look at the right margin of the stamp. Some stamps sold at post office counters in the 1990s had perforations cut off on one side. Stanley Gibbons says this was done to the 1992 Barcelona Olympics set and the 1993 overprints on this set. Maybe other stamps were also treated this way. The idea was to protect the revenues of the official New Issue sellers. You could not compete by going to the post office and buying stamps because you would be supplied with pre-damaged copies. This idea was not a new one. In Hungary in the 1920s, stamps sold over the counter had three pin holes punched in some of the stamps in the sheet. So if you bought a sheet of mint stamps, some of them would be damaged (the Perfin was regarded then as a form of damage). Of course, today Hungary collectors pay a premium for stamps with the three hole Perfins, especially when used on ordinary commercial covers. 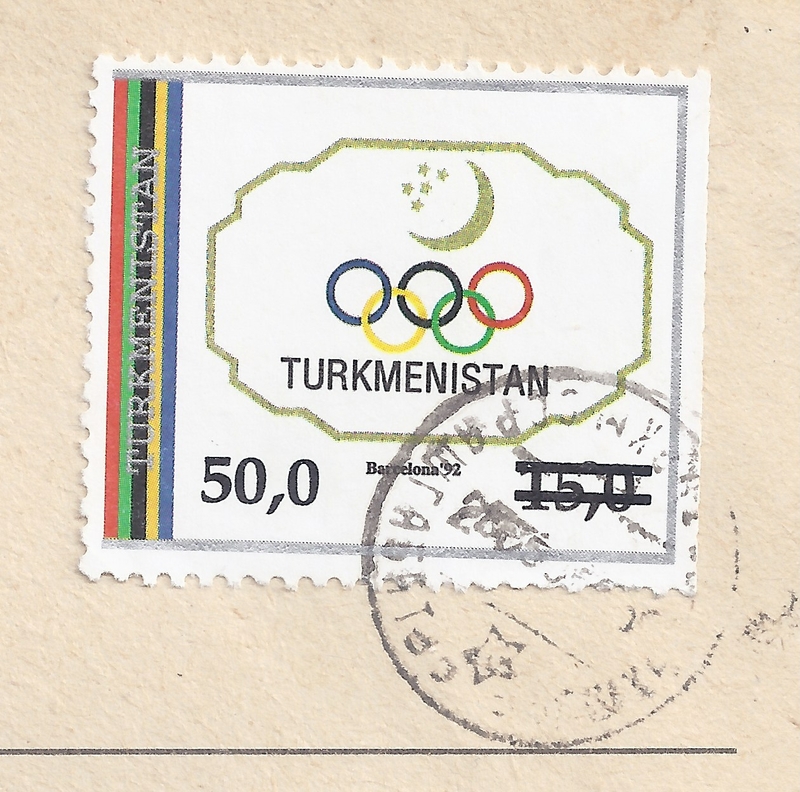 In the case of the Turkmenistan stamps, it is not really possible to collect the damaged copies in mint condition or used off cover - they need to be on cover and used at the time. Why? Well, it's just too easy to fake the interesting stamps by cutting off the margins of any loose stamp you happen to have. That reminds me of a story. Once upon a time, a man walked in to a stamp shop in England and said that a dealer had once sold him some really rare stamps. And now the man wished to sell these really rare stamps. He had bisected stamps from the German Occupation of the Channel Islands - unmounted mint!